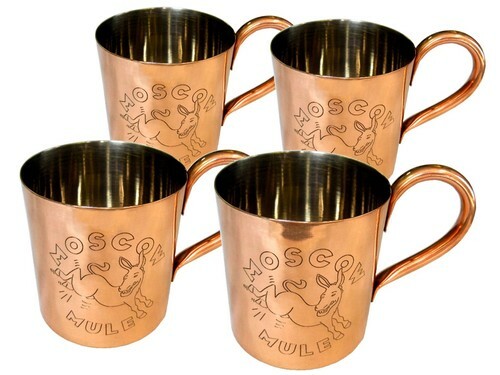 Set of four 12oz Moscow mule copper mugs. All mugs are individually hand crafted so no two mugs will be exactly the same. All cups are new and 100% copper with the exception of a thin nickle plating on the inside of the cup to make them FDA compliant. Some web sites are selling copper mugs without the nickle plating and claiming that this increases the health benefits. Do not believe this for a minute. Hot and acidic drinks can accelerate copper leakage and possible reaction with copper. There is evidence that consuming cold beverages like a Moscow Mule or beer with a solid unlined copper mug is harmful. You must have this lining to be FDA compliant and safe for drinking.